Quotas and targets are still necessary because the business case for diversity is not enough to bring about real change, a panel on diversity told an audience of ad industry leaders last night. The Oystercatchers Club event on diversity at the May Fair Hotel in London saw Suki Thompson, the founding partner of Oystercatchers, introduce a panel of guests from advertising, financial services and media. The panel was asked about unconscious bias by Tom Knox, the president of the IPA, and what could be done to tackle it when companies are trying to hire more diverse staff. 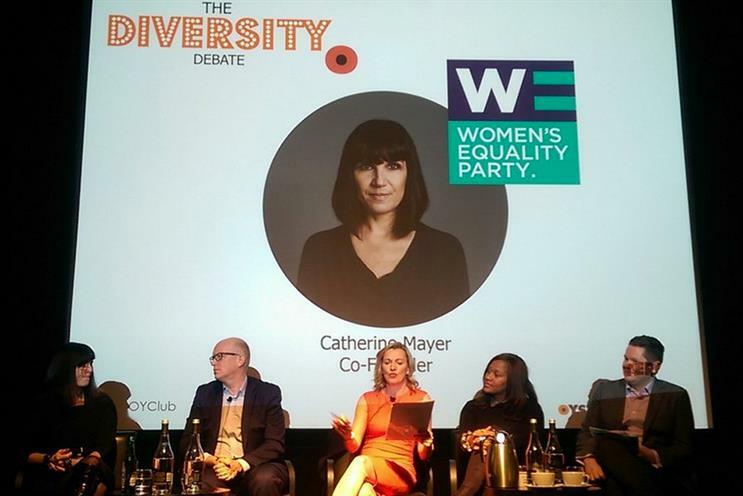 Catherine Mayer, the journalist and founder of the Women’s Equality Party, strongly advocated more quotas and targets within recruitment policies because, progress is "not linear and can go back on itself". She said: "Very well meaning people will tell you they are horrified by the ideas of quotas and targets or anything fixed because they want everything to happen by itself. The fact is, not only does it not happen by itself but progress is very easy to roll back so I think that needs to be factored in any organisation, ways of measuring what you’re achieving." When panel members were asked what made them speak out about diversity, Karen Blackett, the chairwoman of MediaCom, lamented the fact that UK advertising did not reflect British society. Blackett said: "I want to get to a position where I am looking at the room and I don’t know every single black face in the room and what we see on our TV screens and the advertising that we consume genuinely reflects the multicultural brilliant fruit salad that Britain is. Until we change the people inside the agency to reflect the people outside the agency. "There is a business case, there are altruistic reasons for it to happen and I want the UK to be the brilliant beacon that is for the rest of the world." Paul Geddes, a former marketer who is now chief executive of Direct Line Insurance Group, spoke about the need to crack down on "laddish" culture and the need to encourage women to take up more maths and science subjects at A-Level and university. He said: "Someone asked me the other day, how many people in your marketing team have a maths degree… the fact is twice as many boys as girls are taking maths at A-Level. Maths is the future currency that enable people to have a wide range of jobs. We are storing up problems for ourselves if we don’t encourage girls to take ‘Stem’ subjects. The future is going to be much more quanty." Geddes said he has actively tried to address the gender gap at senior management level and pointed to an apparent ‘pay inflation’ for senior women as similar-minded companies all competed for the best female talent. Cilla Snowball, the group chairman and group chief executive of Abbott Mead Vickers BBDO, told the panel the industry was not doing enough to create flexible working practices, such as accommodating working mothers, and cited BT as an example of a company that had "nailed it". Michael Brunt, the chief marketing director and managing director of circulation at The Economist, told the Oystercatchers Club that he had twice rejected a job at the magazine because of its conservative work culture. Brunt said he would have loved it at 20 years old to see a gay man in a senrior management speaking speaking up for diversity: "When I went for a job at the Economist, they said ‘we know you are gay, but probably it’s better if you don’t let people know about it’." He added that agencies and brands needed to "create a culture where being yourself is nurtured and actively rewarded". Geddes agreed, citing his time at RBS where seemingly boring bank managers had the most diverse extra-curricular interests, but were pressured into comforming to a groupthink-led culture.